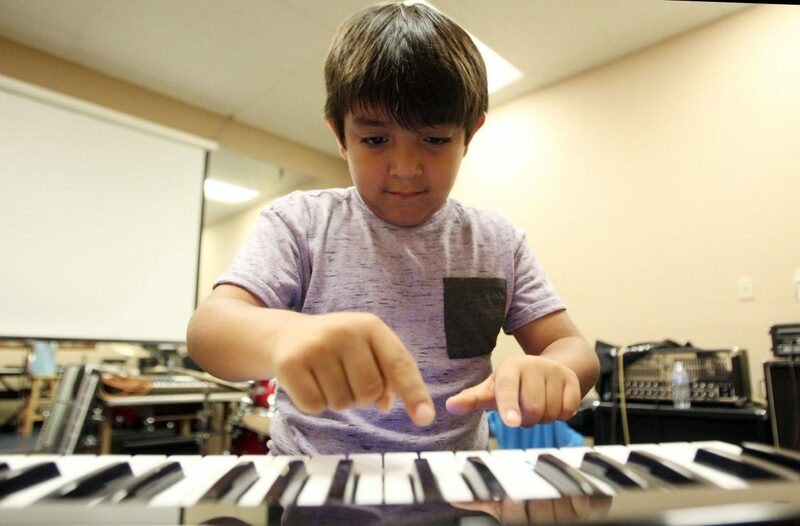 Gavin Ramos, 6, of McAllen during Summer Rock Camp on the electronic piano at the McAllen Music School on Thursday, July 19, 2018 in McAllen. MCALLEN – Coldplay, Imagine Dragons, and 30 Seconds to Mars are just some of the rock bands whose musical style is taught and songs are played at the Summer Rock Camp. 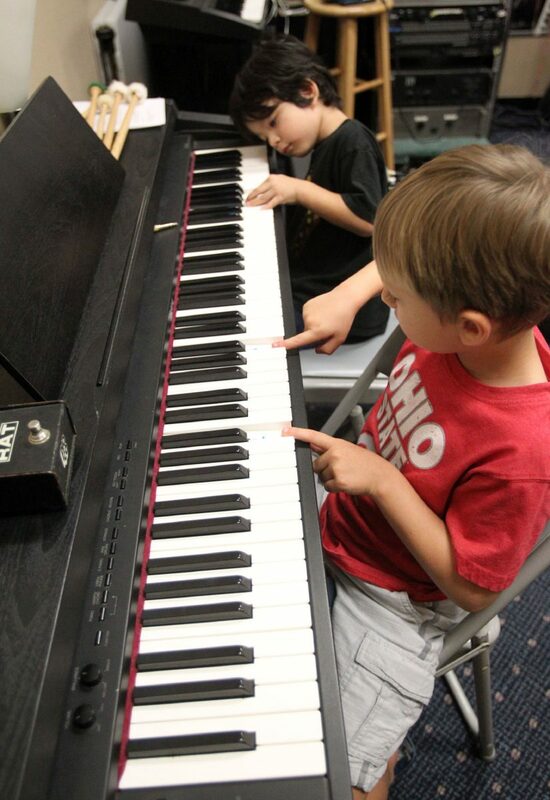 The two-week summer camp is held by Musicademy, McAllen’s Music School, and provides children with musical skills to blossom while being taught voice pitching in conjunction with learning piano, guitar, bass and drums. David A. Rios, owner of Musicademy, opened his studio in 2010 with his spouse, Annette and teaches private lessons throughout the year to more than 100 musicians on the rise. That same year, the 43-year-old began the summer camps where currently 10 students participate in each of the four camps. Camren Palacios, 5, of McAllen and Luis Mares, 4, of Edinburg during Summer Rock Camp at the McAllen Music School on Thursday, July 19, 2018 in McAllen. When Rios began his music teacher role, he already had quite a musical resume thanks to his father as his inspiration. After graduating from McAllen Memorial High School in 1993, he registered for UTPA (now UTRGV), but a few years in, he dropped out and began working at Melhart Music Center. Rios would also play in local bands and do gigs for hire. In 1999, Rios applied to Berklee College of Music in Boston, where he wanted to enter the Music Production and Engineering program, but ran out of money and couldn’t finish. “I came home with $200 bucks in my pocket, so I came back and started teaching. My plan was to go to L.A. and become a producer or see what I could do,” he said. To make money, he rented rooms at Melhart and began teaching music. He was playing in different bands, his main bands named “Hot Ratz,” which was a cover band and “Soulfood,” which was a funk and R&B band. He finally earned his Bachelor’s in Music Production & Engineering from Berklee College of Music in 2001 with a major in guitar. Rios moved to Austin in 2004 with Annette, then his girlfriend, and decided to try his hand at songwriting because most bars there didn’t pick up local bands to perform, they preferred music from elsewhere. As a back-up, if the songwriting and band playing didn’t work out, he had also received a culinary degree from South Texas College. While in Austin, he joined another cover band, called “London Calling,” similar to the Spazmatics, where he as a guitar player and would wear with wigs and dress-up and played throughout Texas. In 2007, Rios returned to the Valley with Annette, now his wife, and he joined a band called, “Meshach Jackson,” who the namesake was also a recording and touring singer-songwriter. It was with the Jackson group that he performed in Austin bars because the band was from New York. With Meshach Jackson, he also played at South by Southwest. During his tenure of being with the group his teaching career progressed once again. In early 2008, he stopped playing with Meshach Jackson and became a full-time teacher because business was on the rise. “I got so busy with many students coming in and I didn’t want to turn anybody away, so I hired another guitar teacher for the students and had to come up with a name, so I called it Musicademy and rented a second room at Melhart (Music Center),” he said. Once word spread about the academy, he began receiving calls from parents about their children wanting voice lessons, piano lessons and training in other instruments. Rios outgrew the rooms at Melhart, where he was since late 2007 and needed more space and moved into their current location at the Royal Palms Plaza, located at 2901 N. 10th St. While still teaching music, in 2014, he received a phone call from Berklee College of Music asking him if he would like to his master’s and is on his way to graduate with his Masters in Music Business in the coming months. “The goal of Musicademy was to do something that had never been done before here and something that I wish I had when I was a kid,” he said. In other words, music is something that is instilled within a person since they’re infants by being taught nursery rhythms and melodies; by listening to any part of the song, the person wants to imitate what is being played and that is where music education begins. “Society teaches us that you’re not a good singer, well no you just haven’t had the right training to do it,” he said. The sessions were held throughout the week, four hours a day; three hours are spent learning instruments including voice pitch then the teachers determine what your best skill is and that is the instrument you learn through rehearsal, which is held in the last hour. During the session, Rios teaches them how to interact with one another and learn as a team. For more information on Musicademy, visit, www.musicademymcallen.com or on Facebook at McAllen’s Music School.